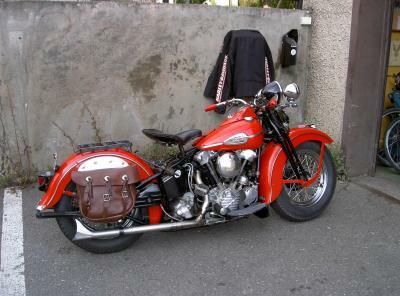 Knucklehead FL 1941 Stock, flight red color! I rebuild this knucklehead from the bottom up! Now the engine is from S&S, but i will put my original (stock) crancase in soon. I have also original right hand sidecar, also in flight red. I use my bike every day in sommer season! Comments for Knucklehead FL 1941 Stock, flight red color! WCM stand for Working Class Motorcycles, specialiste in Harley Davidson + building and parts producing.. Check it out and give me a response on it.. Still have a nice weekend. If you have time please keep in touch and help me. Do you feel that a sound of the S&S engine and sounds of the original engine are different? hello, i absolutley love this bike. it is an exelent restoration.